An exciting evolution has happened in the USGBC in Florida. The diverse USGBC membership in Florida serves as a dedicated community of professionals, advocates and industries. As a nascent industry, we play a leading role in creating jobs, improving education and workforce development; in advancing private and public sector initiatives that champion efficiency in energy, water and beyond; and in catalyzing market forces for better building practices. We invite you to join us! Be it as a practitioner, volunteer, advocate or educator, there are countless roles for individuals and businesses to play in the USGBC Florida Chapter. Help us set our sights on buildings doing more good rather than less harm. Imagine buildings that generate more energy than they use, clean their own water, process their own waste, grow a portion of their food, help us heal from trauma, and that are resilient, healthy and happy places. That's not only the goal. It's the plan! And the long established, well respected USGBC presence in the Sunshine State has gotten significantly stronger. 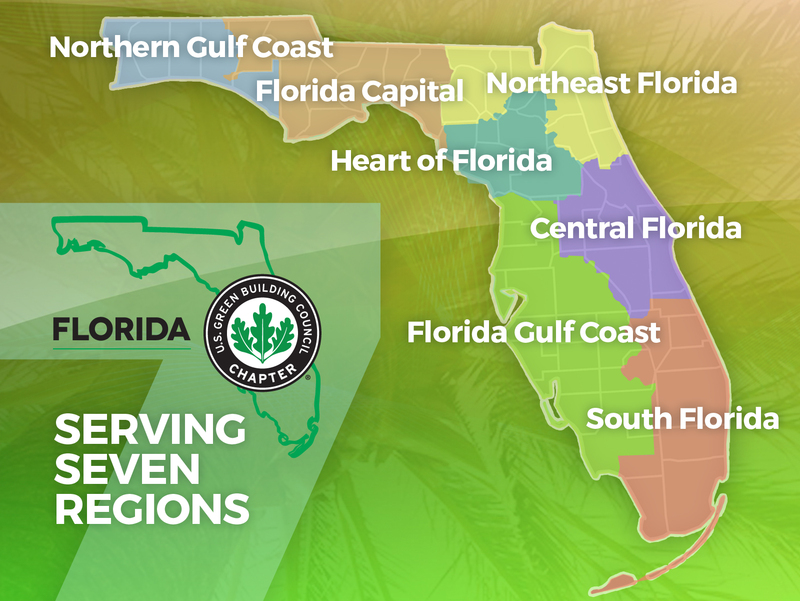 Effective in December 2015, the USGBC Florida Chapter was formed via an exciting union combining the resources and the talents of the seven former Chapters -- now Regions. This new nonprofit (501[c]), volunteer-governed organization brings increased collaboration and coordination across Florida, allowing our amazing local supporters even more time to focus on moving the needle, educating the masses, and implementing sustainability and green-building initiatives in local communities around the State. Green building, and LEED in particular, is helping drive tremendous economic and environmental benefits. Amongst many golden initiatives, the USGBC's support of the establishment of green schools, providing a healthy, safe environment that help students to learn and grow, shines as a beacon of success. Green schools not only enhance a student's ability to learn by keeping them healthy, attentive and present, they use less water and energy and can save an average of $100,000 a year on operational expenses. That is enough savings to hire at least one teacher, purchase 200 computers or buy 5,000 textbooks. Green buildings unquestionably offer great hope for our economy, our environment and our future. For climate change to one day be consigned to the dustbin of history as a challenge humanity faced and overcame, organizations and individuals need to play their part to change how we live our lives in support of top-down change. The USBGC demonstrates clearly that such change is eminently possible ... and don't doubt for one second that such discussions are critical, especially for Florida, where thousands of our communities are ground zero for the economic impacts of sea-level rise, with the greatest value of assets at risk in the world. USGBC national is best known as the developer of the Leadership in Energy & Environmental Design (LEED) green building rating system. LEED provides a superior framework for smart design, construction and operation of buildings and neighborhoods that reduce waste, maximize efficiency and reduce impacts on the environment and on human health. LEED certified buildings save money for families, businesses and taxpayers while creating and supporting jobs. Green building accounts for more than one-third of all non-residential design and construction, and will grow to more than one-half of all construction within the next five years, with nearly 8 million additional jobs attached to the industry. LEED, which was developed by the private sector as a voluntary tool, has become the most successful, market-driven green building rating system in the world. Companies the world over rely on LEED certification to reduce operating and energy costs while responsibly enhancing their bottom lines. While LEED is the preeminent tool in the green building industry, the movement is about achieving maximum results, communicating best practices and driving innovation. On average, green buildings reduce energy use by 24-50%, water use by 40%, and construction waste by 70%, as compared with conventional buildings. In addition, green building projects see better occupant health, increased productivity. and serve as models for healthier future generations. 2016 USGBC Convergence in Jacksonville.